Whether it's for a fancy master bathroom suite or a half bath down the hall, a well appointed bathroom adds value to your home. A favorite upgrade or add on, flooring will often define the style for these utilitarian spaces. 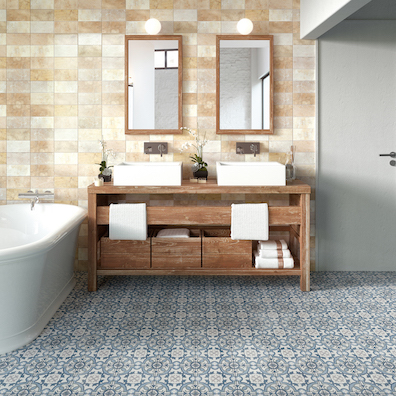 First choice for bathrooms is ceramic tile. 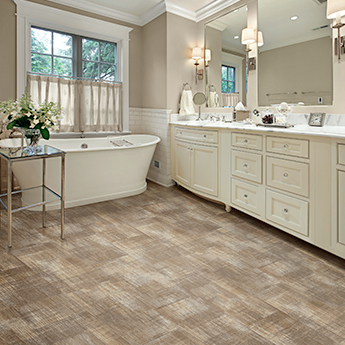 Yes, a lot of that has to do with the fact that ceramic is already featured in most bathrooms and that it offers an incredible array of style and design options that no other flooring can match. And don't forget ceramic’s unparalleled performance, especially in wet spaces. Ceramic is, for all those reasons, the number one choice for bathrooms even though it can be quite expensive. Right now, black and white is big, as are wood and stone looks. And there’s a definite move toward large format tiles that lend a touch of drama to even smaller spaces. There is a resurgence of subway tile offerings as well as new interest in hexagons. As well, ceramic can be a bit cold so this is one place where you might consider radiant heating systems – to go with your fancy towel warmer. Whether it’s sheet vinyl planks and tile (LVT/P), WPC or SPC rigid core, these floors also work exceptionally well in areas where moisture is present; many are even waterproof. That’s what makes vinyl, in particular luxury vinyl, the number two choice for bathrooms. And, all vinyl products offer something for these spaces that no other floor can – a little bit of “give” underfoot that could make a big difference in case of a fall. Up until recently, I would not have recommended laminate flooring for a bathroom -- until that is, waterproof laminate came along. 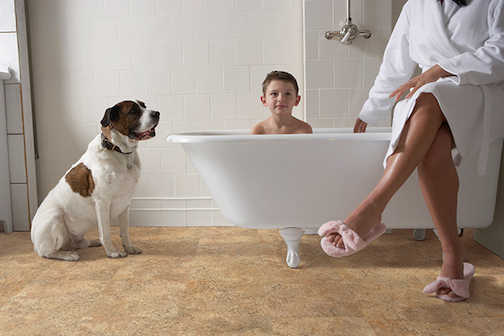 Today's waterproof floors can definitely stand up to surface spills but I still worry about standing water -- which is not uncommon in a bathroom. For that reason, laminate acmes in at number 3. While technically engineered hardwood can perform in the spaces, I wouldn't risk. Over time, it will surely show the cumulative signs of water damage. There is, however, a real wood alternative -- yes, waterproof hardwood. It's real hardwood except that it has been treated throughout the board to resist moisture penetration. While still brand new, several of the major and leading hardwood flooring suppliers have ventured into this new category and promise outstanding performance, even in bathrooms. COREtec, the original waterproof WPC floor.